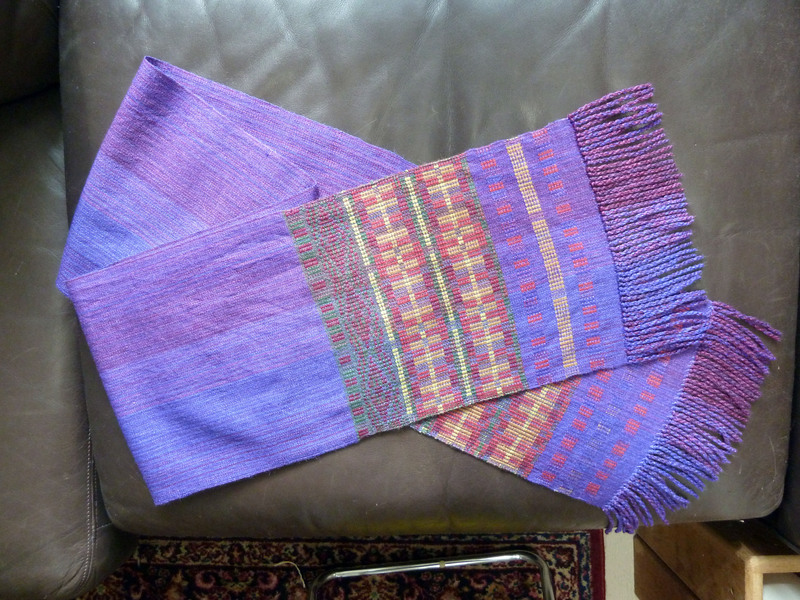 I finally got back to the loom last week after what seemed like ages – many things seemed to interfere: trips to the coast, catching up at work now that my boss is back from Argentina, gallery activities, just life in general. 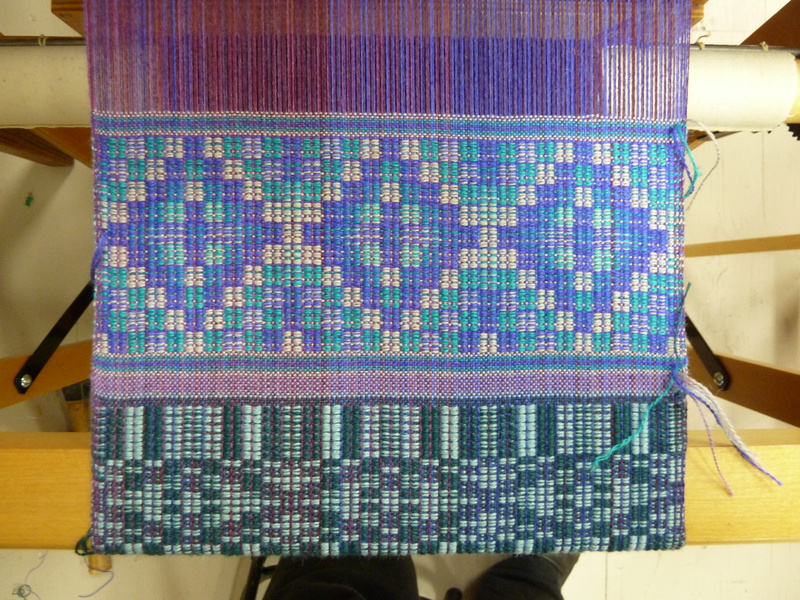 I put a second warp on my little loom for more “summer & winter polychrome” scarves. 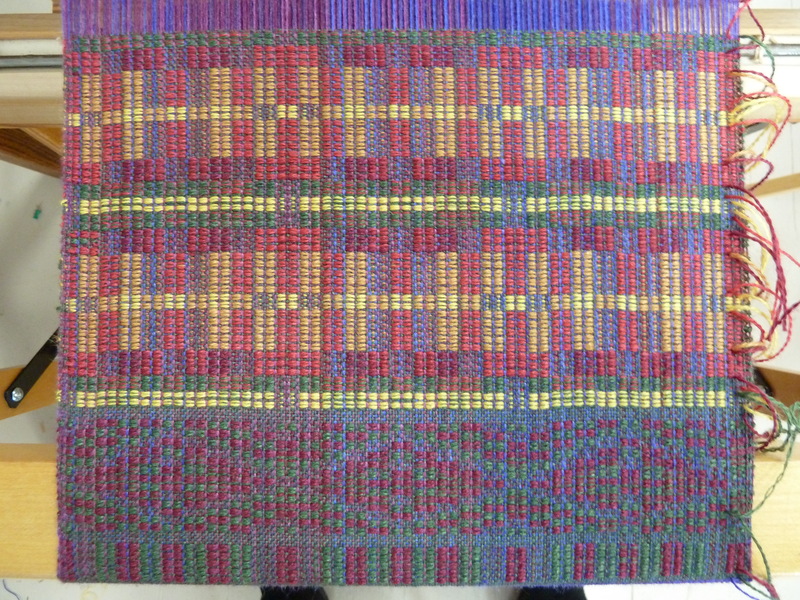 This time I used shades of purple in the warp, then got out Deb Menz’s Colorworks book to come up with ideas for weft colors. The first scarf was based on a “double split complement” color scheme. Of course, I am somewhat limited by the colors I have on hand in the Zephyr silk/wool. When sampling before actually starting the scarf, I wasn’t at all sure I was going to like the green, which is called “Basil”. But amazingly, it works! 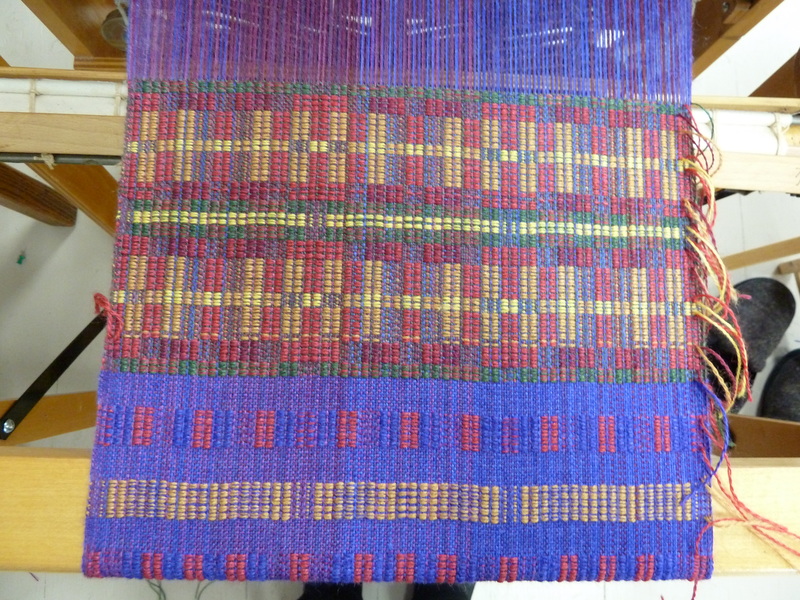 For the plain weave portion, I used a dark purple. 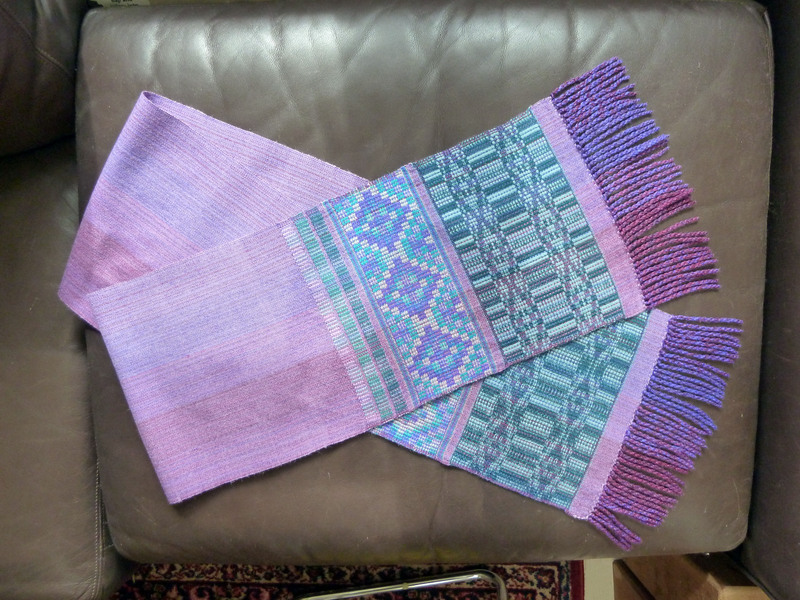 For the second scarf I used Lilac for the plain weave sections, and an “analogous” color scheme for the polychrome work at each end. In some of the patterns, there are as many as three or even four shots of different colors in different sheds, before the tabby tie-down that holds the whole thing together. This builds up a lot of color on the surface, both solid areas and color mixes, that gives it so much richness. 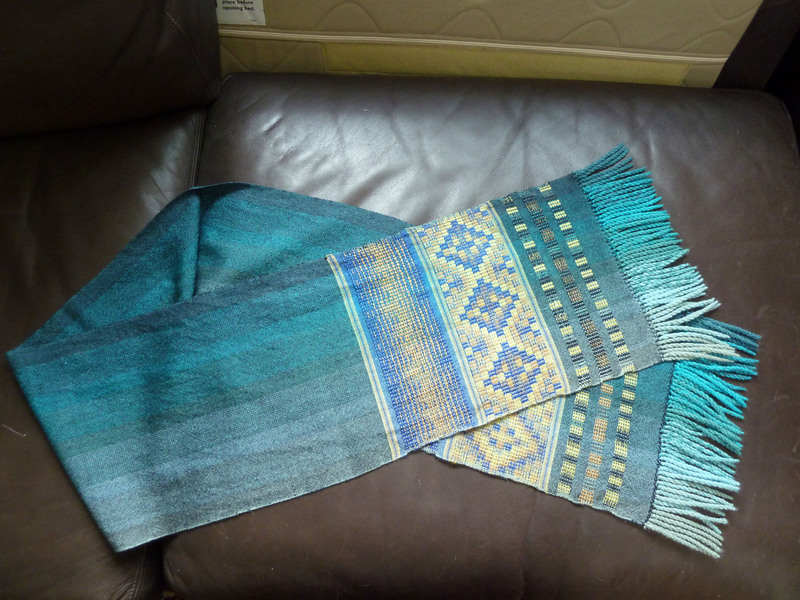 Doing the finishing work on these scarves seems to take almost as much time as weaving them! It seemed like I was twisting fringes all day long yesterday…. But they did soften up nicely after washing and pressing. Here are pictures I took this morning of the 4 scarves finished so far. 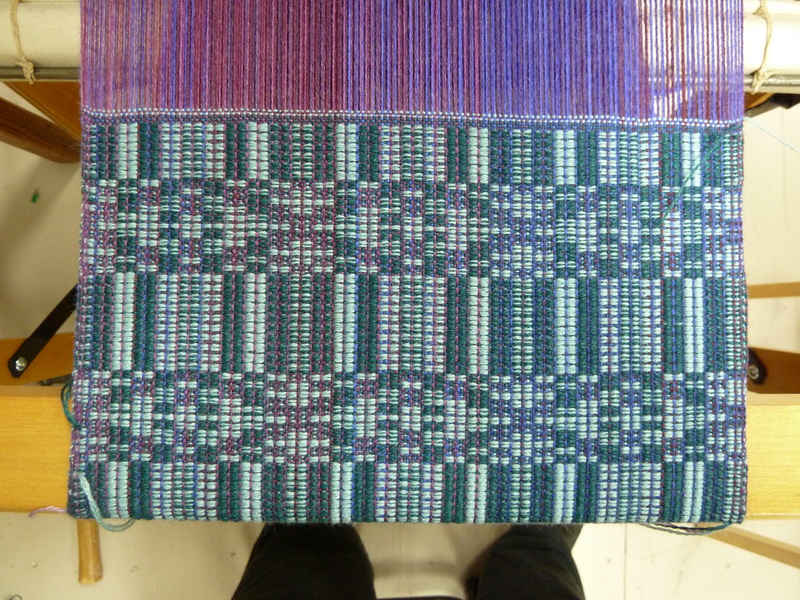 Today I will wind a new warp for 2 more, then after that I think I will work on something else for a while. Hi Katie! Janet Ebaugh here, and I’m in Spokane these days. Those are the most pretty and beautiful patterns you’ve made. Especially like those fringes, which are special x 10. Janet! I think you commented before, but I didn’t know it was you, and your blog didn’t reveal much…nice to hear from you. I hope Ai get to see them in person. on April 11, 2012 at 8:48 am | Reply yipujen1234! I didn’t think I had a blog, just a name for it! Will need to do something about that– yours has been a real inspiration, frankly. Email me and I’ll share some Spokane stories: je.ebaugh@gmail.com. Best to Rick and the cat people! Your scarves are stunning! 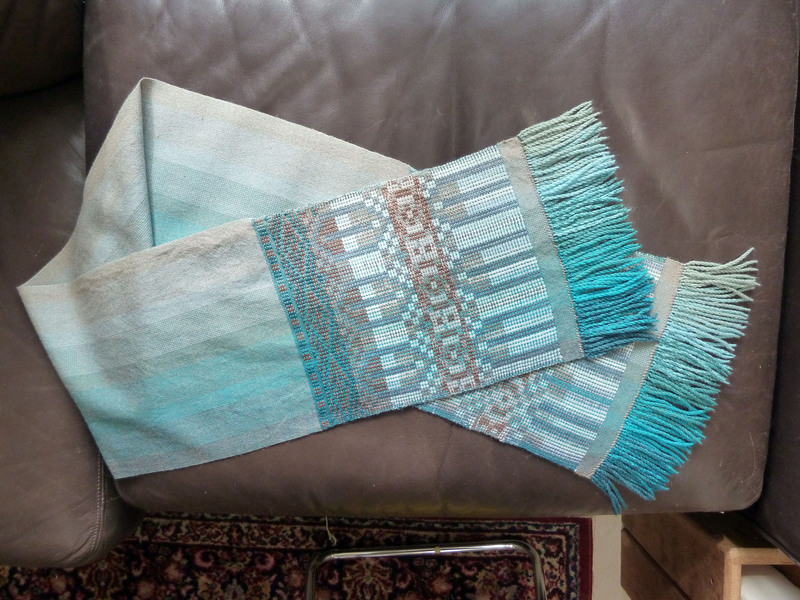 I love how you partnered the really fancy edges with plain weave – it works well.